Tet Offensive 1968. 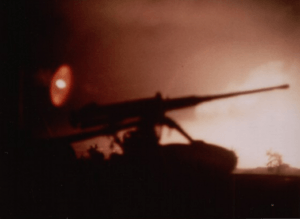 12.7mm M2 machine gun at USMC Camp Carroll firing on advancing enemy troops as seen from LZ Betty 15 miles southeast. Explosives are chemical compounds that cause explosions; they flare up and burst with a loud sound. Explosive material has many special characteristics: it is a chemically unstable material, it changes its form very fast and, while changing its form, it explodes by bursting and making loud sounds. There are two types of explosives: low explosives and high explosives. This classification depends on their rate of explosion. Low explosives conflagrate (= burn very fast). High explosives detonate (= explode with bursts). A low explosive is a material, which burns very fast, but does not explode generally. For exploding them, people mix them with high explosives. Sometimes, even a low explosive may detonate. A high explosive bursts and explodes very fast. High explosives produce more pressure than low explosives but low explosives are more safe to use. People use low explosives in fuses, rocket engines and fireworks, and high explosives in mining and demolition (destroying old bridges and buildings). Military weapons use high explosives. Gunpowder and ammonium nitrate are low explosives. High explosives may belong to different groups: primary explosives and secondary explosives. Primary explosives are very unstable and rapidly react to shock, friction, and heat. Any shock, friction, or heat makes primary explosives to burn or blast fast. Secondary explosives are much more safe to use and do not react very fast to shock, friction, and heat. Any shock, friction, or heat may burn such explosives, but not make them to burst and blast. Some people call secondary explosives as base explosives. Some people also tell about another group of explosives. These are tertiary explosives. These explosives do not react to shock, friction, and heat. For explosion, tertiary explosives may need a mixture with secondary explosives. Primary explosives are used as detonators: that is, to cause the secondary explosives to explode. Mercury fulminate, picric acid, lead azide, nitroglycerine and iodine nitride are examples of primary explosives. TNT, dynamite, hexogen, HMX and Torpex are examples of secondary explosives. Explosive material Facts for Kids. Kiddle Encyclopedia.